By the way, the date of this posting is the mid-point between Waite’s birthday and Crowley’s birthday. How fun is that! My purpose for including this section is to document my personal ritual practices in attempting to evoke the spirit presence of A. E. Waite and Aleister Crowley, with my own Holy Guardian Angel present, while conceiving Spirit Keeper’s Tarot. This is not a how-to instructional nor does it purport to teach anything about evocation. Treat this section as nothing more than a memoir of what I did to create my tarot deck. I set out on the Major Arcana cards with the intention of evoking Waite and Crowley, but sincerely did not feel like I succeeded during the crafting of the Majors. I never actually felt their presence (tenuous and subjective as it is anyway) but did feel the very strong and powerful presence of my Holy Guardian Angel, who I’ve opted to leave unnamed in this Book. Instead, I felt like my work on the Major Arcana was being used as a test or trial, to see whether I was worthy of being given assistance in my endeavor. So the crafting of the Majors was very much my own. It wasn’t until commencing the Minors, beginning with the Four of Scepters (Four of Wands) that I felt the very strong and powerful presence of both Mr. Waite and Mr. Crowley. Before writing this chapter of the Book of Maps, I had decided to keep this part of my crafting process private, in large part because I had no idea what I was doing. I was also aware that revealing such practice could be construed as a marketing ploy, which I certainly did not want. So I made no mention of it. Before undertaking a Key set (i.e., Realm of Twos, Realm of Threes, etc. ), I’d light two long taper candles, one white and one black, with W etched in gold on the white candle and C etched in silver on the black. I placed the white candle on a hand-drawn mat of Waite’s rectified birth chart (birth chart rectification is an astrological calculation used to best guess the time of birth when it is unknown). Considering the number of times the word “rectified” comes up in Waite’s Pictorial Key, I personally found a lot of humor in having to use a rectified birth chart for his evocation. 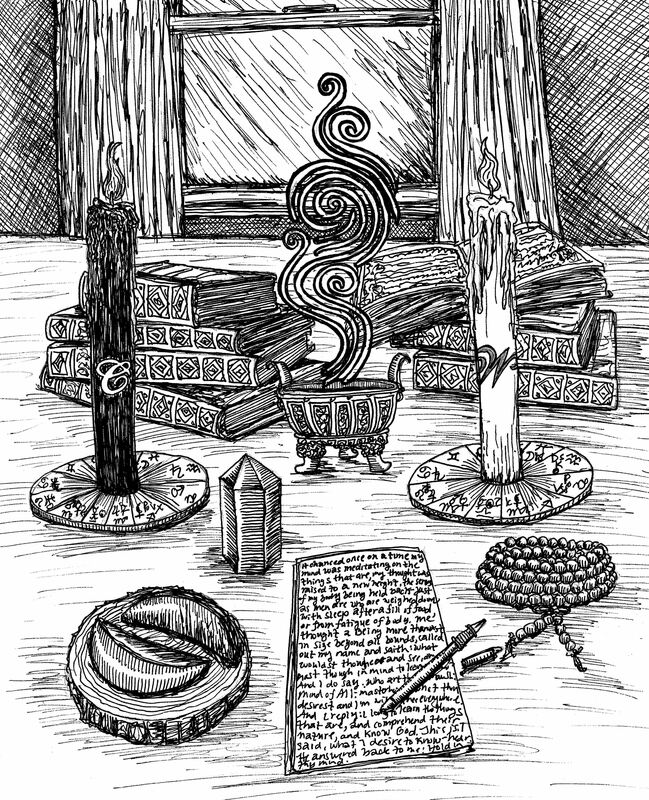 Then I placed the black candle on a hand-drawn mat of Crowley’s birth chart. The hand-drawn birth charts were as precise to the degree as I could render them, with both the traditional sacred seven, key personal sensitive points, Arabic Parts, and modern dwarf planets. Here I’m presenting the software generated versions of their charts. Let’s address the astrological charts of Arthur Edward Waite and Aleister Crowley. I wasn’t able to source reliable records of Waite’s time of birth, but we do know his date of birth and location of birth. Meanwhile, we seem to have Crowley’s full birth and time details. 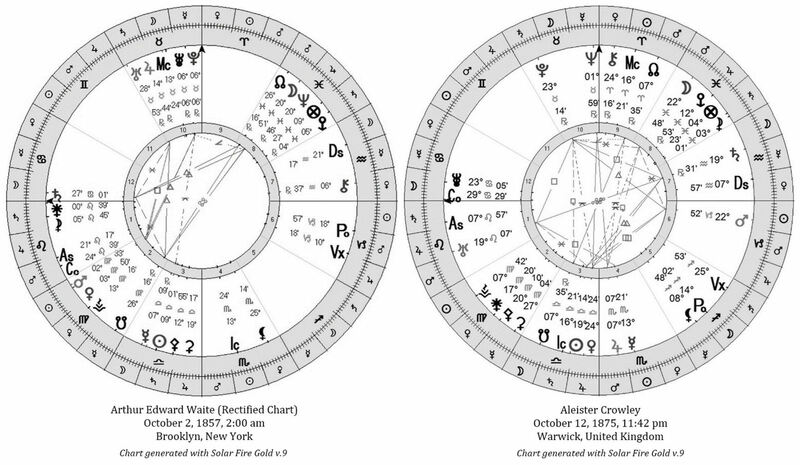 Note that both charts pictured here are Tropical Whole Signs (not the more common Placidus charts that modern astrologers tend to use). Based on what we do know, both Waite and Crowley were sun sign Libras and, as it turns out, also both moon sign Pisces. Though Waite was born in 1857 and Crowley in 1875 (an 18-year difference), and on different days of October, the two days just happen to have the moon fall in Pisces and both happen to be born under a waxing gibbous moon phase. The white candle would be placed to my right and the black candle to my left. Physical copies of Pictorial Key and Book of Thoth would be close by. Prior to commencing work on my cards, I’d place my left hand on the mat of Crowley’s chart and my right hand on the mat of Waite’s chart, then recite: “With [naming my HGA], my Holy Guardian Angel bearing witness, present, and standing guard, I hereby call upon the spirits of Arthur Edward Waite, born October 2, 1857, and Edward Alexander ‘Aleister’ Crowley, born October 12, 1875, and ask that both appear to me to lend guidance, instruction, commentary, inspiration, and tutelage in the crafting of my tarot deck. I am now working on [state the set of keys I’m at work on for that session, ex., Realm of Fours, Realm of Sevens, the Aces, or the Court Queens, etc.]. I am open and receptive of your presence, by me or through me, in the manner of your preference.” (Yes, so to be more precise, I didn’t just endeavor for evocations, but was open to either evocation or invocation.) Also of note, when I did feel their presence in-session, I’d always address them as respectfully as I could, with the title “Mr.” so it was always Mr. Waite and Mr. Crowley. Click to download high-resolution image file for your free use. Earlier I acknowledged that while crafting the Majors, I didn’t feel Waite or Crowley’s presence. However, by the Minor Arcana, I definitely did. In the beginning (the Realm of Fours, Fives, Sixes, and Sevens), the collaboration was cordial enough, with what felt to me like polite, restrained, and dignified disagreements. I also felt babied, like perhaps whatever I had achieved in crafting the Majors impressed them, and so there was an eagerness in the collective spirit presence to help me and to give me very detailed, instructive guidance. My feeling was, I think I’ve impressed them with my diligence and dedication. I would also be honest and confessional when I did not understand something, and the response I felt was always patient, sympathetic, and kind, followed by strong, effective nudges in the right direction. The polite and restrained pleasantries, I felt, soon turned into more vehement disagreement, or at the very least a polarizing energy was airborne around me. By the Seven Upper Realms, I no longer felt a collective spirit presence, but it was either one or the other, and I felt very much stuck in the middle and ineffectively mediating. The analogy I would give is I felt like a child caught in the middle of her two parents arguing with each other, on the brink of divorce, and while both parents were loving enough to not intend to take it out on the child, it inevitably happened and it just felt awkward. I didn’t want to say too much in the regard of my very personal, subjective, and wholly unverifiable impressions of the evocation experiences, but I did want to say one thing about Crowley. I never felt like he was evil. Actually, I found his presence to be nurturing (maybe the wrong choice of wording). There was an irreverence, maybe, but not toward me, so I wouldn’t be able to attest to that irreverence anyway. If I had known nothing of Crowley’s biography prior to the evocation experiences, I would not have gathered any of that popularized information from my experiences. He came across as kind, interesting, and paternal in his own way, without being authoritarian (whereas Waite felt to be more of a stickler for traditions, pushing me to read the Bible and to become more learned about Christian mysticism, Western alchemy, and Hermeticism). Mr. Crowley felt to be more open and interested in my Eastern esoteric background than I felt Mr. Waite was, though that makes sense, given some of the Taoist and Hindu influences in the Thoth deck and in Crowley’s writings. There were times I had the palpable impression that Waite was discouraging of my decision to call in Crowley and work with Crowley. The discouragement would come across as cautionary, with a sense of genuine concern for me, followed almost immediately by yet another push to go read the Bible. I often felt like Waite had rules for me, and wanted me to play by those rules. Waite would convey to me the absolute importance of boundaries so that I could stay focused and ever mindful of Spirit, rather than get distracted, whereas Crowley asserted that boundaries inhibited union, and inhibited union would impede the advancement of my training. Waite also felt emphatically encouraging of my interests in connecting tarot and psychology. In my evocation experiences and perceptions, the general sense I would get was that Crowley directed me backward, to consider more ancient mythology, whereas Waite directed me forward, to consider how I could express the tarot through my own pictorial language, the one I speak at present in modernity. Waite encouraged me to think within the context of my own time period, and not try to parrot or resurrect the past. Crowley wanted me to unearth what had been lost. Waite wanted me to be more innovative and advance the tarot beyond what it has been. Meanwhile Mr. Crowley taught a very different lesson: be transparent, and not only do you show all, but tell all. Everything I know, tell it all, even the subjective and unverifiable, I should put it all out there and trust that people have the intelligence and dignity to decide for themselves what applies to them and their paths and what doesn’t. I don’t need to be the decision-maker on their behalf. I am not their keeper. They are their own keeper. So what if they forego taking their own paths to follow mine? Eventually they’ll realize they took the wrong path and correct themselves, and they will be all the wiser because of it. Plus, if I am so convinced that what I have discovered is the Truth with that capital T, then why would I not share it with the world, explicitly in full detail, so that there would be no mistaking or misinterpreting of that incredible so-called Truth? Unless—he’d taunt—I did not in fact believe I had discovered the Truth with that capital T and therefore I am no Teacher with that capital T. Teachers Tell the whole Truth, he insisted. That is the way of Thoth. In the issue of who bears a stronger influence over the final design of Spirit Keeper’s Tarot, Waite or Crowley, I would emphatically insist that it is equal. But here’s the thing. Waite (or I should give a caveat and say my imaginative perception of the evocation experience) could be more adamant about executing designs a certain way and could feel a bit more overbearing on me—for my own good. Meanwhile I felt like Crowley gave me a lot more leeway and breadth to be myself. He’d advise, offer thoughts, but then really make it clear that I’m being given the space to go in my own independent direction. So Crowley’s influence is absolutely there in those cards, but his influence was more often of the kind that pushed me to be independent. I think as it is with any child, we tend to visibly resemble one parent more than we do the other, but if you get to know us well, you’ll see that the indelible influence of both parents is absolutely there. 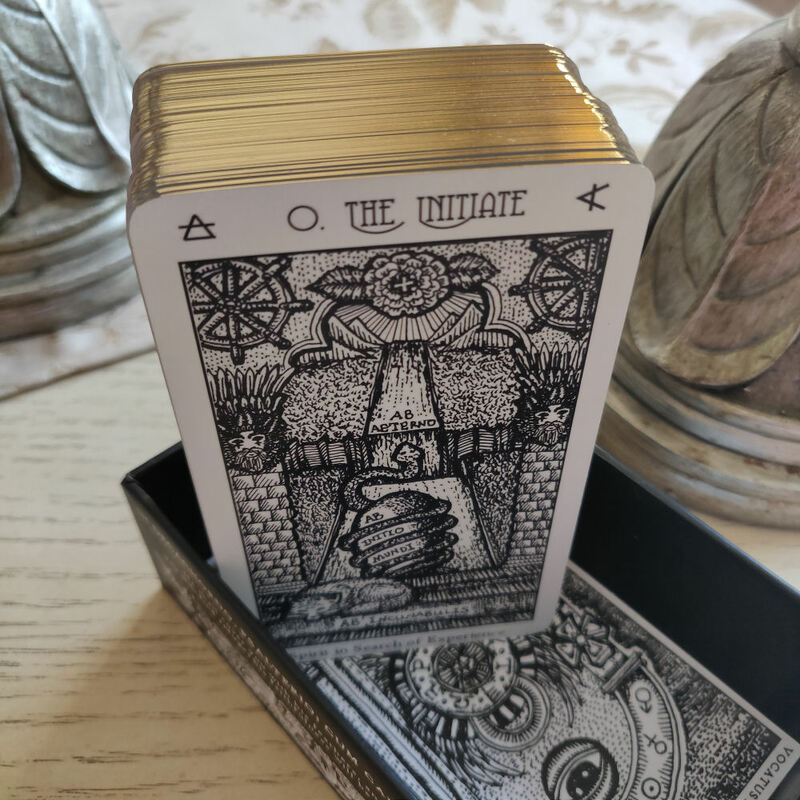 If it satiates anybody’s curiosity, what I do find amusing is I don’t think Waite or Crowley like the name of my tarot deck. If either had more say in the matter, they would have had me go with a different name, I believe. They seemed to like Two Paths Tarot, and I might have gone with that deck name for them if I hadn’t publicly announced Spirit Keeper’s Tarot as the name of the deck already. The sentiment I intuited from the evocation experiences was that both insisted this was my deck and Spirit Keeper is not and should not be a transmission of their ideas. Instead, they were lending counsel to me on how I might best express my own ideas or how to find my own path. So, for instance, Crowley could very much be an all-or-nothing type of personality. Either it was his and therefore entirely his way, or it wasn’t his and therefore he would give wide latitude for my personal viewpoints to come through, because he had no stake in the game. Whereas Waite would be more than happy to tell me that my viewpoint was wrong. The relationship I perceive on my end is very much that of parents and child. To a large extent, I would assert that I was a respectful child and listened to my instructions as much as I could. However, I am still my own person with my own way of thinking, and as nearly every child does in adolescence, rebelled against some of those dictated instructions, especially as I gained more and more confidence in myself, which was attributed directly to their tutelage. It’s the irony of good parenting, right? If you’re a wise parent, then you will have taught your child how to find her own voice and eventually she will use it to disagree with you. Overall, I feel content and at peace with the crafting of my deck because I leave with the sense that both of these spiritual tarot parents are proud of me. Let me explain. It’s like my actual parents. Overall, when all is said and done, I know in my heart that my parents are proud of me. Do they agree with every decision I’ve made? Absolutely not. If they had more control over me and more say over some of the decisions I’ve made, they would have pushed me hard to go in a different direction. Yet my parents are proud of my accomplishments and proud of the kind of person I’ve become. Likewise, that’s how I feel from my evocation experience and the final work product of the deck. My spirit mentors don’t agree with every design decision I’ve made for my deck, but they are also understanding enough to know they need to leave the youth to their folly and the lattice of my choices do need to be my own. I feel they’ve come to appreciate my heart, my intentions, and that they are ultimately proud of how far I’ve come under their tutelage. So I am content and at peace with my Waite-Crowley reconciliation efforts. Did I successfully evoke the spirit presence of Waite and Crowley? I would never give an unequivocal yes and I would not make such a wild claim. I can only say that’s what it felt like to me. The 38-day religious, ceremonial, and mystical experience of crafting Spirit Keeper’s Tarot is not one I will soon forget. Was it all nothing more than fabrications from my own imagination? Hallucination? Faulty memory? Even if my experience was phantasmagoria, I say so what? It produced a tarot deck I adore and am eager to share with you and anyone willing to give me the time of day. It caused a cosmic shift inside of me. It deepened my perspective of the tarot. In the mere span of 38 days, I am not the same person at the completion of this deck as who I was when I first started. I was a spirit in search of experience, and when I achieved that experience, I went in search of science, and when I found my science, the evocation petitions brought me face to face with Spirit. I get why you didn’t share your process. This blog post had me giggling. I could very nearly “feel” both Messers arguing around you as your head and hand were diligently working on a card. Reading this has deepened the sense of gratitude I have for you in what you set out to do and what you accomplished. Your drive astounds me, Benebell. I didn’t think I could be more honoured and excited to acquire this deck, but here we are. Many blessings in all you do. Sharing your process with us makes this a deeply personal and honorable tarot for me. Thank you, Benebell, for the generous human spiritual being you are.